And they’re off! 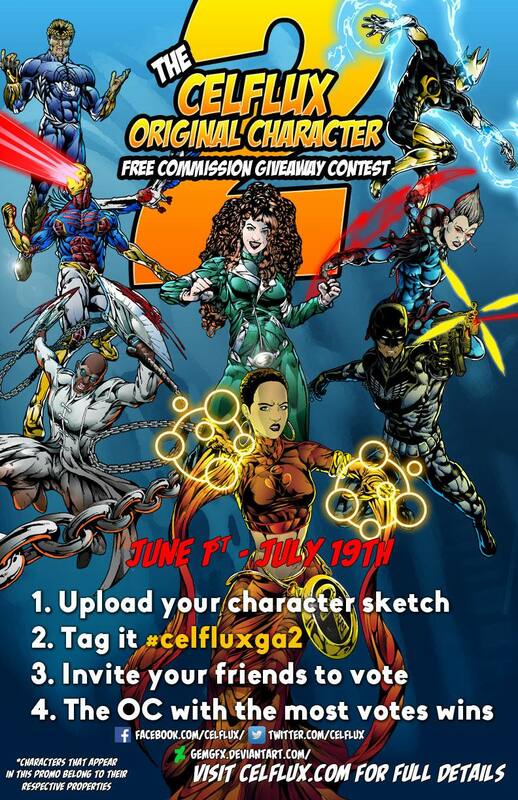 Voting is now open for the Celflux Original Character Free Commission Giveaway Contest. Please have a look at the characters below. Vote for your favorite character. Invite your friends to vote for your character. You may vote once every 24hrs. Voting closes on July 31st, 2016 at Midnight Eastern Time. As we draw near to the release of Celflux issue no.3 on June 1st,2016, we are going to be hosting two competitions. The first of which will be a return of our recently held OC Character Free Commission Giveaway Contest. We last held this contest in January, and we had a really good response. So we’re going to do it again. Do you have an independent, original character? Here’s your chance to get it illustrated for free.Yes, it’s the return of the Celflux Original Character Free Commission Giveaway Contest. For the months of June and July 2016, I’ve decided to give away a free commission of one OC to one lucky creator. Details: All characters remain the property of their owners. Deadline for submission is June 31st, 2016. Voting begins July 1st, 2016 and ends July 31st, 2016. The winner will be announced July 31st, 2016. Only original, independent characters will be accepted. 1. Upload your OC via Facebook, Twitter, or Deviantart with a sketch and short description. 2. Submissions will be collected and put to a vote. 3. Invite your friends to like,share, comment on, and most important “Vote” for your character. 4. The character with the most votes wins. Prize: There will only be ONE winner this time and they will receive an 11″ x 17″ 300 dpi commission of their original character. So let’s do this. Contest begins on June 1st. That’s the launch date for Celflux issue no.3. So good luck to all who decide to take part. Disclaimer: The host of this contest reserves the right to modify or discontinue this contest at any time. We’ve decided to move up the date for the closing of votes. Our new closing date is July 19th, 2016. Take note of the new date. We announce the winner on Wednesday, July 20th, 2016. Thanks again to all the talented creators for submitting your awesome OCs and being a part of our contest. Posted in Uncategorized and tagged Celflux, comic, Comic Book Colors, Comic Book Inks, comic books, comics, contest, Dixie Ann Archer McBain, Everard McBain, GemGfx, independent comics, original character, t-shirt giveaway.